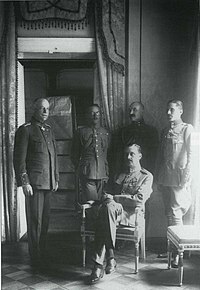 Gustaf Mannerheim as regent of Finland (sitting) and his adjutants (from the left) Lt. Col. Lilius, Cap. Kekoni, Lt. Gallen-Kallela, Ensign Rosenbröijer. A regent is a person selected to act as head of state (ruling or not) because the ruler is a minor, not present, or debilitated. Currently there is only one ruling Regency in the world, sovereign Liechtenstein. The following is a list of regents. It should be noted that those who held a regency briefly, for example during surgery, are not necessarily listed, particularly if they performed no official acts; this list is also not complete, presumably not even for all monarchies included. The list includes some figures who acted as regent, even if they did not themselves hold the title of regent. Prince Naif bin Al-Abdullah from the 20 July to 5 September 1951, due to the schizophrenia of his brother King Talal, who was in a Swiss mental hospital. A regency council (Ibrahim Hashem, Suleiman Toukan, Abdul Rahman Rusheidat and chairing Queen Mother Zein al-Sharaf Talal) took over during the king's ailment & continued after the king's forced abdication (on 11 August 1952), serving from 4 June 1952 to 2 May 1953, until King Hussein came of age. Crown Prince Hassan, from 4 July 1998 to 19 January 1999 while his brother King Hussein was undergoing cancer treatments. Queen Mamohato was regent for the exiled King Moshoeshoe II in 1970 and again in 1990, and after his death in 1996. Prince Franz Joseph was regent for four months for his grand-uncle Sovereign Prince Franz I. Hereditary Prince Hans-Adam was regent for his father Sovereign Prince Franz Joseph II from 1984 until his death in 1989. Hereditary Prince Alois has been regent for his father Sovereign Prince Hans-Adam II since 15 August 2004. Duke Adolph of Nassau was Regent from 8 April 1889 to 3 May 1889 and from 4 November 1890 to 23 November 1890, during the terminal illness of Grand Duke William III. Grand Duchess Marie Anne was Regent to her husband, Grand Duke William IV, during his terminal illness from 19 November 1908 to 25 February 1912, and then Regent to her daughter, Grand Duchess Marie-Adélaïde, during her minority from 25 February 1912 to 18 June 1912. Hereditary Grand Duke Jean was Regent for his mother, Grand Duchess Charlotte, from 4 May 1961 to 12 November 1964. Hereditary Grand Duke Henri was Regent for his father, Grand Duke Jean, from 4 March 1998 to 7 October 2000. Tengku Muhammad Ismail (eight-years of age at the time), co-reigned with the three-member Regency Advisory Council (Majlis Penasihat Pemangku Raja) from 2006 to 2011. His father, Sultan Mizan Zainal Abidin the Sultan of Terengganu was elected as 13th King of Malaysia. The Malaysian constitution does not allow a simultaneous reign as both the King of Malaysia and as Monarch of the King's native state (deemed absent on the State throne). Sultan Mizan was crowned as King on 13 December 2006 and the prince as the Regent (Pemangku Raja) of Terengganu effective on the same date. The Wattasid Vizier Abu Zakariya Yahya was regent during the minority of the Marinid sultan Abd al-Haqq II; the Wattasid Viziers however kept the power beyond the majority of Abd al-Haqq II, until 1459 when most members of their family were killed by the sultan, allowing him to return to power. Princess Carolina, during the minority of her brother, William V, and jointly with Duke Louis Ernest, between 1765 and 1766. Crown Prince Olav was regent for his father King Haakon VII in 1945, awaiting his return at end of the Second World War, and during his illness between 1955 and 1957. Crown Prince Harald was regent during the illness of his father King Olav V between 1990 and 1991. Mariana of Austria, regent of Spain during the minority of her son Charles II from 1665 to 1675. Luis Manuel Fernández de Portocarrero cardinal and archibishop of Toledo during the illness of Charles II and Philip V absence from 1700 to 1701. A Supreme Central and Governmental Junta of Spain and the Indies from 25 September 1808 to 29 January 1810 and a Regency Council from 29 January 1810 to 24 March 1814 during the imprisonment/abdication of Ferdinand VII. Maria Christina of the Two Sicilies during the minority of her daughter Isabella II from 1833 to 1840. Baldomero Espartero, Prince of Vergara during the minority of Isabella II from 1840 to 1843. Francisco Serrano, duke of la Torre, during the interregnum between the reigns of Isabella II and Amadeo I, from 1869 to 1870. Maria Christina of Austria, regent during her pregnancy after her husband's death and then for her son Alfonso XIII from 25 November 1885 – 7 May 1902.
the Caudillo general Francisco Franco, became de facto regent for life in 1947 to 1975, after reinstating the monarchy with a vacant royal throne ultimately filled by Juan Carlos. Mats Kettilmundsson (1318–1319), between the deposition of king Birger Magnusson and the election of three-year-old Magnus Eriksson as king. Ingeborg of Norway (1319–1326) president of the council of regents for her under age son, king Magnus Eriksson, in both Sweden and Norway. Bengt Jönsson Oxenstierna (1448; together with his brother Nils Jönsson Oxenstierna), during the interregnum between the death of Christopher of Bavaria and the election of Karl Knutsson (Bonde) as king. Nils Jönsson Oxenstierna (1448; together with his brother Bengt Jönsson Oxenstierna), during the interregnum between the death of Christopher of Bavaria and the election of Karl Knutsson (Bonde) as king. Jöns Bengtsson Oxenstierna (1457; together with Erik Axelsson Tott), during the interregnum following the first deposition of King Charles VIII, and again (1465–1466), following his second deposition. Erik Axelsson Tott (1457; together with Jöns Bengtsson Oxenstierna) (1466–1467), following the end of Jöns Oxenstierna's second regency. Svante Nilsson (1503–1512), succeeding Sten Sture the Elder. Sten Sture the Younger (1512–1520), succeeding Svante Sture. Gustav Eriksson Vasa was firstly Regent (1521–1523) after the final dissolution of Kalmar Union, but soon was proclaimed King. Duke Charles of Södermanland (1599–1604) after ousting his Catholic nephew King Sigismund, until he himself claimed the throne. Axel Oxenstierna (1632–1644), during the minority of Queen Christina. Dowager Queen Hedwig Eleonora of Holstein-Gottorp (1660–1672), during the minority of her son King Charles XI, again (1697–1699), during the minority of her grandson King Charles XII, and finally, de facto, during Charles's absence from Sweden during the early years of the Great Northern War (1700-1713). Charles, Duke of Södermanland (1792–1796) for his underage nephew Gustav IV Adolf of Sweden, and again (1809) after Gustav IV Adolf was deposed and before Charles himself was proclaimed King Charles XIII. Crown Prince Charles John (1810–1818), for his adoptive father King Charles XIII, due to Charles XIII's incapacity. Crown Prince Charles (1857–1859), for his father King Oscar I, due to Oscar's incapacity. Prem Tinsulanonda, regent from October 13 to December 1, 2016 while King Vajiralongkorn was in mourning for his father and predecessor. George, Prince Regent (1811–1820), during the incapacity of his father, George III. After the death of Queen Anne in 1714 a regency under Lord Parker, the Lord Chief Justice, was set up while King George I was sent for to take up the crown. George, Prince of Wales (1716–17), during the absence of his father, George I.
Caroline of Ansbach (1729; 1732; 1735; 1736–37), during the absences of her husband, George II. William Longchamp (intermittently 1189–1199), during the absences of Richard I on crusade, in prison, and in France. Queen Catherine of Aragon, while Henry VIII was in France. In this time she played a large role in the defeat of the Scots at Flodden, and was Queen Regent for several months. Queen Catherine Parr, while Henry VIII was in France. William III personally led his army into battle each year during the Nine Years' War (1689–1698). In his absence, the kingdom was administered by his wife and co-ruler Queen Mary II until her death in 1694, and thereafter by a council of seven Lord Justices (sometimes referred to as the "Lords Regent"): William Cavendish, 1st Duke of Devonshire (1640–1707), Charles Sackville, 6th Earl of Dorset (1638–1706), Sidney Godolphin, 1st Earl of Godolphin (1645–1712), Thomas Herbert, 8th Earl of Pembroke (1656–1733), Charles Talbot, 1st Duke of Shrewsbury (1660–1718), John Somers, Baron Somers (1651–1716), and Thomas Tenison, Archbishop of Canterbury. The same notes apply; inclusion in this list reflects the political reality, regardless of claims to the throne. Before the 1881 unification, there were essentially four rulers' capitals: Kabul, Herat, Qandahar and Peshawar (the last now in Pakistan); all their rulers belonged to the Abdali tribal group, whose name was changed to Dorrani with Ahmad Shah Abdali. They belong either to the Saddozay segment of the Popalzay clan (typically styled padshah, king) or to the Mohammadzay segment of the Barakzay clan (typically with the style Amir, in full Amir al-Mo´menin "Leader of the Faithful"). The Mohammadzay also furnished the Saddozay kings frequently with top counselors, who served occasionally as (Minister-)regents, identified with the epithet Mohammadzay. For most of the reign of the epileptic and severely disabled Emperor Ferdinand I (1835-1848), Ferdinand's uncle, Archduke Ludwig, acted as a de facto regent. The Oath of the Princess Imperial Isabel as regent of the Empire of Brazil, c. 1870. John, Prince Regent, was responsible for elevating Brazil to the status of Kingdom in 1815. One year later, he was acclaimed King of Portugal, Brazil and Algarves. Pedro I, Prince Regent, was responsible for declaring the independence of Brazil, in 1822, during his regency (1820–1822), after his father, John VI, returned to Portugal. Some months later, he would be acclaimed Emperor of Brazil. Maria Leopoldina, Empress consort of Brazil, acted as Empress Regent while her husband, Pedro I, was away – especially during the war against Uruguay. Provisional triumviral regency – from 7 April to 18 June 1831, comprised José Joaquim Carneiro de Campos, marquess de Caravelas, Nicolau Pereira de Campos Vergueiro and Francisco de Lima e Silva, baron of Barra Grande, was formed to control the country after the abdication of Peter I. Permanent triumviral regency – from 18 June 1831 to 12 October 1835, comprised the baron of Barra Grande as well as José da Costa Carvalho, Marquis of Monte Alegre, and João Bráulio Muniz. Pedro de Araújo Lima, Marquis of Olinda – from 1837 (provisional to 1838) to 1840, during what was considered the retaken of the Conservative Party. Isabel, Princess Imperial of Brazil, was Princess Regent of the Empire of Brazil three times (1871–1872; 1876–1877; 1887–1888) while her father travelled abroad. During her last regency, she signed the abolition of slavery in Brazil (known as the "Lei Áurea", or "Golden Law"), on 13 May 1888, whereby Isabel got the sobriquet Isabel the Redeemer. For the act of signing the Golden Law, she was awarded the Golden Rose by Pope Leo XIII. Stefan Stambolov, during the absence of Prince Alexander Battenberg from the Bulgarian throne between 28 August 1886 and 3 September 1886 and the vacancy of the throne between 7 September 1886 and 14 August 1887. Kiril, Prince of Preslav and Bogdan Filov and Nikola Mikhov together as Regency Council, during the minority of the former's nephew Simeon II (1943–1944). Duke of Zhou, during the minority of his nephew Song Ji, the King Cheng of Zhou until he was old enough to rule. Huo Guang, during the reign of Emperor Xuan of Han, the emperor reaffirmed that all important matters were to be presented to Huo before Huo would present them to the emperor. The source of title of highest imperial nobility of ancient Japan "Kanpaku" (Regent). Sonin, Suksaha, Ebilun and Oboi during the minority of the Kangxi Emperor from 1662 to their various deaths or downfalls. The last one, Oboi fell from grace in 1669. After the abdication of Nicholas II of Russia, the throne of the Grand Duke of Finland was vacant and according to the constitution of 1772, a regent was installed by the Finnish Parliament during the first two years of Finnish independence, before the country was declared a republic. Pehr Evind Svinhufvud, installed in January 1918, resigned in late 1918. Baron Carl Gustaf Emil Mannerheim, resigned 1919 with the passing of the new constitution. Adèle of Champagne and Guillaume de Champagne, Archbishop of Reims (1190–1191), during the absence of her son Philip II on the Third Crusade. Blanche of Castile (1248–1252) and Alphonse, Count of Poitou and Toulouse (1248–1254), during the absence of her son and his brother Louis IX on the Seventh Crusade. Mathieu de Vendôme, Abbot of Saint-Denis and Simon de Clermont, Sieur de Nesle, during the absence of Louis IX on the Eighth Crusade (1270). Philip the Tall (1316), during the interregnum between the death of his brother Louis X and the birth of Louis' posthumous son John I, and during the minority of the short-lived John I.
Philip, Count of Valois and Anjou (1328), from the death of his cousin Charles IV until the birth of a posthumous daughter to the late king brought about Valois' own accession to the throne. Charles, the Dauphin (1417–1422), Charles VI's eldest surviving son, who also claimed the regency. Louise of Savoy (1515–1516), during the absence of her son, Francis I, in Italy. (1552) While her husband Henry II left the kingdom for the campaign of Metz. Philippe II, Duke of Orléans (1715–1723), during the minority of Louis XV; often called "the Regent", since he was the last regent of France. **The related era and style are commonly referred to as the Régence (analogous to the British Regency period). Louis-Stanislas-Xavier, comte de Provence, while living in exile, self-declared Regent for his nephew Louis XVII of France after the 1793 guillotining of King Louis XVI, until the young pretender's death in 1795. Charles-Philippe de France, comte d'Artois, appointed Lieutenant General of the Kingdom by a temporary government from 14 April 1814 until Louis XVIII arrived from England. Empress Eugenie, three times for her husband, Napoleon III of France, during his absence. Josef Ludwig von Armansperg (1832–1835): on behalf of the minor King Otto. Archbishop Damaskinos Papandreou (1944–1946): on behalf of King George II until his return after World War II. Crown Prince Constantine, Duke of Sparta (1964): on behalf of the ill King Paul. General Georgios Zoitakis (1967–1972): appointed by the military junta of the time when the last reigning king, Constantine II of Greece, fled to exile after a failed royal countercoup. Military dictator Colonel Georgios Papadopoulos (1972–1973): then Prime Minister, assumed the additional role of regent until the monarchy was abolished by referendum. Prince Albrecht of Prussia (1885–1906), during the interregnum following the death of Duke Wilhelm in 1884, when the throne could not be filled due to the status of the heir, the Duke of Cumberland, as an enemy of the Reich. Friedrich Franz IV, Grand Duke of Mecklenburg-Schwerin (1918), due to the near extinction of the Mecklenburg-Strelitz line. Helena and Beloš Vukanović, in 1141–1146 during the rule of infant Géza II. Helena was the mother and Beloš her brother. Joseph August, briefly after the fall of the Hungarian Soviet Republic in 1919. He is the last Habsburg to be a head of state. Isabella d'Este (1519–1521), during the minority of her son Federico II. Louise d'Artois (1854–1859), during the minority of her son Robert I.
Christine Marie of France (1637–1663), during the minority of her son Charles Emmanuel II. Marie Jeanne of Savoy (1675–1680), during the minority of her son Victor Amadeus II. Daewon-gun, Lord Regent for his son King Gojong of Joseon during the late 19th century. Countess Teresa, during the minority of her son Afonso I (1112–1139). Styled herself Queen of Portugal. Afonso, Count jure uxoris of Boulogne-sur-Mer, after Pope Innocent IV had deposed his brother Sancho II, and before assuming himself the throne as Afonso III, following Sancho's death (1245–1248). Styled himself Regent and Defender of the Kingdom. Queen Leonor, for her daughter Beatrice I (1383). João, Mestre de Avis, during the Dynastic Crisis, and before assuming himself the throne as John I (1384–1385). Styled himself Regent and Defender of the Kingdom. Queen Eleanor, during the minority of her son Afonso V (1438–1439). Peter, Duke of Coimbra, during the minority of his nephew Afonso V (1439–1448). Queen Catharine, during the minority of her grandson Sebastian I (1557–1562). Cardinal Prince Henry, during the minority of his grandnephew Sebastian I (1562–1568). Queen Luísa, for her son Afonso VI (1656–1662). Prince Peter, for his brother Afonso VI, and before assuming himself the throne as Peter II, following Afonso's death (1668–1683). Catherine, Queen Dowager of England, Scotland and Ireland, for her brother, Peter II, in 1701 and 1704–05. John, Prince Regent, during the incapacity of his mother Mary I, and before assuming himself the throne as John VI, following her death (1792–1816). Princess Isabel Maria, following her father's (John VI) death, and whilst awaiting the arrival of her brother Peter IV to assume the throne (1826–1828). Prince Michael, for his niece Mary II, and before usurping the throne for himself as Michael I (1828). Peter, Duke of Bragança (former King Peter IV), for his daughter Mary II (1831–1834). King jure uxoris Ferdinand II, during the minority of his son Peter V (1853–1855). Lascăr Catargiu, Gen. Nicolae Golescu, Col. Nicolae Haralambie (1866), between the overthrow of Alexandru Ioan Cuza and the coronation of Carol I as Prince. The regent Yariri (r.) and his successor Kamani (l.), on a relief from Carchemish. An example of regency from ancient history. Yariri for the later king Kamani in the Neo-Hittite state of Carchemish located at the present-day border of Turkey and Syria (early to mid 8th century BC). Queen Dowager Jiu during the minority of her son King Zhao Xing. Duong Van Nga during the minority of her son King Dinh Phe De, after her husband King Dinh Tien Hoang was assassinated. Empress Mother Linh Nhan, while her husband King Ly Thanh Tong led a military campaign against the kingdom of Champa (1st time) and again, during the minority of her son King Ly Nhan Tong (2nd time). Empress Mother Linh Chieu (1138 - 1158) for her son King Ly Anh Tong. Tran Thua and Tran Thu Do during the reign of King Tran Thai Tong. Tran Thua also called Retired Emperor Trần Thái Tổ, is Emperor Tran Thai Tong's father. He was the only one who had not held the throne of the Trần Dynasty. Grand Chancellor Tran Thu Do is Tran Thai Tong's uncle. Empress Mother Tuyen Tu (1443 - 1453), during the minority of her son King Le Nhan Tong. Tuyên phi Đặng Thị Huệ during the minority of her son, Lord Trinh Can. ^ The Oxford English Dictionary defines the term as "A person appointed to administer a State because the Monarch is a minor, is absent or is incapacitated." ^ a b E. B. Pryde (23 February 1996). Handbook of British Chronology. Cambridge University Press. pp. 45–46. ISBN 978-0-521-56350-5. ^ "Kuhina Nui 1819–1864". Centennial Exhibit. State of Hawaii Department of Accounting and General Services. Retrieved 3 October 2009. ^ Trevor Bryce: The World of the Neo-Hittite Kingdoms: A Political and Military History. Oxford, New York 2012, p. 95.